Evicted meets Nickel and Dimed in Stephanie Land's memoir about working as a maid, a beautiful and gritty exploration of poverty in America. Includes a foreword by Barbara Ehrenreich. At 28, Stephanie Land's plans of breaking free from the roots of her hometown in the Pacific Northwest to chase her dreams of attending a university and becoming a writer, were cut short when a summer fling turned into an unexpected pregnancy. She turned to housekeeping to make ends meet, and with a tenacious grip on her dream to provide her daughter the very best life possible, Stephanie worked days and took classes online to earn a college degree, and began to write relentlessly. She wrote the true stories that weren't being told: the stories of overworked and underpaid Americans. Of living on food stamps and WIC (Women, Infants, and Children) coupons to eat. Of the government programs that provided her housing, but that doubled as halfway houses. The aloof government employees who called her lucky for receiving assistance while she didn't feel lucky at all. She wrote to remember the fight, to eventually cut through the deep-rooted stigmas of the working poor. 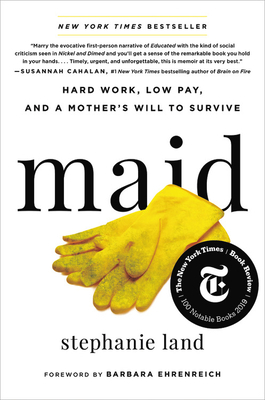 Maid explores the underbelly of upper-middle class America and the reality of what it's like to be in service to them. "I'd become a nameless ghost," Stephanie writes about her relationship with her clients, many of whom do not know her from any other cleaner, but who she learns plenty about. As she begins to discover more about her clients' lives-their sadness and love, too-she begins to find hope in her own path. Her compassionate, unflinching writing as a journalist gives voice to the "servant" worker, and those pursuing the American Dream from below the poverty line. Maid is Stephanie's story, but it's not her alone. It is an inspiring testament to the strength, determination, and ultimate triumph of the human spirit. Journalist Stephanie Land's work has been featured in The New York Times, The Washington Post, The Guardian, Vox, Salon, and many other outlets. She focuses on social and economic justice as a writing fellow through both the Center for Community Change and the Economic Hardship Reporting Project. BARBARA EHRENREICH is the author of fourteen books, including the bestselling Nickel and Dimed and Bait and Switch. She lives in Virginia. "An eye-opening journey into the lives of the working poor." with bleak arithmetic, to offer her testimony. It's worth listening to." "What this book does well is illuminate the struggles of poverty and single-motherhood, the unrelenting frustration of having no safety net, the ways in which our society is systemically designed to keep impoverished people mired in poverty, the indignity of poverty by way of unmovable bureaucracy, and people's lousy attitudes toward poor people... Land's prose is vivid and engaging... [A] tightly-focused, well-written memoir... an incredibly worthwhile read." "[A] heartfelt and powerful debut memoir.... Land's love for her daughter... shines brightly through the pages of this beautiful, uplifting story of resilience and survival." "A moving, intimate, essential account of life in poverty."